The latest U.S. Department of Agriculture (USDA) cotton projections for 2016/17 indicate that global cotton stocks are forecast to decrease for the second consecutive season. World ending stocks are projected at 94.7 million bales for 2016/17, 7 percent (nearly 7.4 million bales) below 2015/16. (One bale is 480 pounds.) Global cotton stocks reached a record 112.5 million bales in 2014/15, largely due to government policies in China that supported growth in China’s reserve stocks (fig. 1). Since then, policies to reduce the surplus were implemented, and stocks in China, as well as global supplies, have declined. Although they remain projected at relatively high levels, stocks in China at the end of 2015/16 are estimated at 62.3 million bales—a decline of 8 percent from 2014/15—accounting for 61 percent of world stocks. A further decline is also projected for 2016/17, when stocks in China are forecast at 54.7 million bales; these stock levels and China’s 58-perecent share of the world total are projected to be at their lowest in four seasons. USDA’s 2016 U.S. cotton crop projection remains at 14.8 million bales in June and is 15 percent above the final 2015 crop. While the recent precipitation across much of the Cotton Belt was generally beneficial, the effect on area and yield remains uncertain as planting was delayed and is still in progress. The planting estimate of 9.56 million acres will be updated in USDA’s Acreage report, which will be released June 30. The report will include actual plantings as of early June, as well as estimates for any remaining cotton to be planted. As of June 12, 89 percent of the expected cotton acreage had been planted, similar to last season but below the 2011-15 average of 93 percent. In addition, 13 percent of the cotton area was squaring by June 12, above last season’s 11 percent but equal to the 5-year average. Based on current projections, U.S. cotton harvested area is forecast at 8.8 million acres in 2016, reflecting a below-average abandonment rate of 8 percent, which is slightly above 2015’s 6 percent. The 2016 U.S. cotton yield is forecast at 807 pounds per harvested acre, compared with 766 pounds per harvested acre in 2015. USDA’s National Agricultural Statistics Service will begin “in field” production surveys in August. U.S. cotton demand for 2016/17 is projected at 14.1 million bales, unchanged from May. Exports account for 10.5 million bales, while mill use contributes 3.6 million bales. With larger supplies expected in 2016/17, shipments are forecast to increase from 2015/16’s 9 million bales; the U.S. share of world trade is forecast to rebound to 31.5 percent, near the 2014/15 level. U.S. cotton mill use is projected to increase slightly in 2016/17, as the U.S. textile industry remains competitive but is constrained by manmade fiber competition. Based on these supply and demand estimates, U.S. cotton ending stocks for 2016/17 are projected at 4.8 million bales, 700,000 bales above the beginning level and the highest since 2008/09. As a result, the stocks-to-use ratio is estimated to rise slightly to 34 percent, also the highest in 8 years. The forecast for the 2016/17 U.S. average farm price is projected to range between 47 and 67 cents per pound, with the midpoint of this range slightly below 2015/16’s estimate of 58 cents per pound. In June, the 2015/16 U.S. mill use estimate was reduced slightly to 3.55 million bales as data through April 2016 indicate that cotton spinning has slowed compared with the previous season. As a result, ending stocks were increased and are now forecast at 4.1 million bales, with the stocks-to-use ratio equal to 33 percent. World cotton production in 2016/17 is projected to increase 5 percent (5 million bales) from the previous season to 103.2 million bales. Larger crops are forecast for most major cotton-producing countries in 2016/17, with China being the key exception. India is expected to be the largest producer for a second consecutive season in 2016/17, reaching 28 million bales (+1.2 million bales) and 27 percent of the global cotton crop. With slightly lower area, a yield rebound from 2015/16’s relatively low level is expected. Production in China is forecast at 21.5 million bales (-1.0 million bales) in 2016/17, the lowest crop since 2000/01. Area devoted to cotton continues to trend lower in China and is projected at its lowest in over 65 years. With government policies reducing support for cotton farmers—particularly in eastern China—most of the crop is now grown in Xinjiang, a high-yielding region in northwestern China. As a result, the national yield is forecast at a record 1,614 kg/hectare in 2016/17. Production for Pakistan in 2016/17 is projected at 9 million bales (+2.0 million bales), nearly 29 percent above the previous season as a return to normal yields is expected. Brazil’s crop is forecast to decline slightly to 6.4 million bales, as a decline in area is expected to more than offset a higher yield. World cotton area harvested in 2016/17 is projected at 30.4 million hectares (75.2 million acres), slightly below 2015/16 and the lowest since 2009/10. The global cotton yield is forecast at 738 kg/hectare (658 pounds per acre) in 2016/17, similar to the average of the last two seasons. Global cotton mill use is projected at 110.6 million bales in 2016/17, 1.8 million bales above 2015/16, as stable cotton prices and improved economic growth strengthen demand. If realized, cotton mill consumption would be the highest since 2010/11’s 115.6 million bales. China and India remain the leading spinners of raw cotton, with a combined consumption of nearly 58 million bales, or 52 percent of the global total for 2016/17. China’s cotton consumption is forecast at 33.5 million bales in 2016/17, up 3 percent (1 million bales) from the previous season. China’s consumption is expected to benefit as local textile mills gain access to raw cotton at competitive prices from the national reserve; as a result, the need for cotton yarn imports is expected to be reduced from previous years. 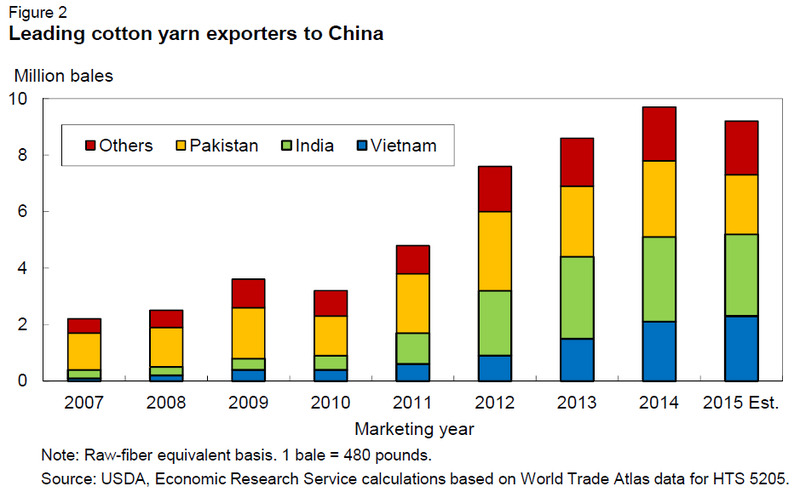 In 2015/16, China will import more than 9 million bale-equivalents of cotton yarn, with India, Vietnam, and Pakistan providing about 80 percent of the total (fig. 2). Government policies intended to build spinning capacity in Xinjiang will also support China’s consumption growth. Mill use in India is projected to remain stable in 2016/17 at about 24.3 million bales. 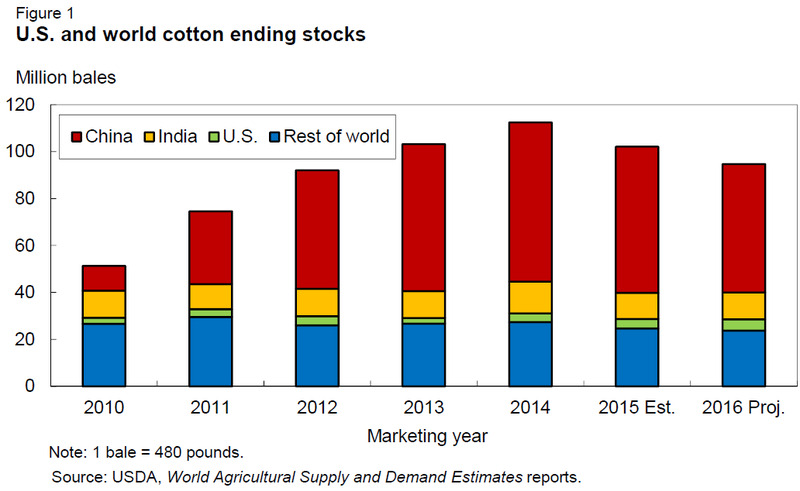 Although growth is not expected as a result of China’s reduced yarn import demand, India’s cotton consumption is forecast to remain near the record set in 2014/15. However, mill use in other foreign countries is anticipated to rise in 2016/17. In Pakistan—the third largest spinner—cotton consumption, at 10.5 million bales, is projected to expand slightly as their crop rebounds. Gains in mill use are also expected to continue in Bangladesh and Vietnam and reach record highs in 2016/17, with cotton consumption forecast at 6.0 million bales and 5.1 million bales, respectively. Meanwhile, Turkey’s consumption is projected to rise slightly for the fifth consecutive season to 6.5 million bales in 2016/17. In contrast, world cotton trade is forecast at 33.3 million bales in 2016/17, 900,000 bales below a year earlier and the lowest since 2008/09, when global trade totaled 30.3 million bales. While exports are projected to rebound in the United States with the larger crop forecast, shipments from India are expected to be lower. Decreased trade relative to 2015/16 is due to sharply lower expected imports by Pakistan, as production there recovers from devastating insect damage last season. At the same time, 2016/17 imports are forecast to rise in Bangladesh and Vietnam, where mill consumption is expanding. China is projected to import 4.5 million bales of raw cotton, similar to its 2015/16 imports but well below levels of just a few years ago, due to changes in policies aimed at reducing surplus stocks. Global ending stocks are forecast at 94.7 million bales at the end of 2016/17, a 7- percent reduction from the beginning level. Stocks would be at their lowest in 4 years. While use is expected to exceed production for the second consecutive season in 2016/17 and reduce stocks, the world stocks-to-use ratio is estimated to remain at a relatively high 86 percent; this level compares favorably with an average of 89 percent for the previous 5 years, but well above the 2006/07-10/11 average of 49 percent. As a result, the 2016/17 world cotton price is expected to remain near the current season’s average. In 2015/16, the world price is estimated to average near 70 cents per pound, the lowest in 7 years. On June 6, the U.S. Department of Agriculture (USDA) announced the Cotton Ginning Cost-Share (CGCS) program. The new program provides an estimated $300 million in cost-share assistance payments to cotton producers for their ginning costs based on their 2015 cotton plantings. The CGCS program was established under the statutory authority of the Commodity Credit Corporation Charter Act and is under the administration of USDA’s Farm Service Agency (FSA). The CGCS program only applies to producers who have reported 2015 cotton acres to USDA/FSA. Producers must be actively engaged in farming and also comply with conservation compliance provisions. In addition, a producer’s 3-year average adjusted gross income may not exceed $900,000 to be eligible. Under the CGCS program, the cost-share payments are capped at $40,000 per individual or entity and do not count against 2014 Farm Act payment limitations. Through the CGCS program, eligible producers can receive a one-time cost-share payment based on the producer’s share of reported 2015 cotton acres and the regional payment rate announced by USDA. The payment rate was determined to equal 40 percent of the average ginning cost for each production region. These payment rates ranged from $36.97 for the Southwest to $97.41 for the West. Table A provides regional examples of the CGCS payment calculation. For illustrative purposes, the table below is based on a producer reporting 100 acres of cotton in 2015 and the producer having a 100-percent stake in the production. In this example, the CGCS payment would equal $4,744 for the producer in the Southeast, $5,626 for the Delta producer, $3,697 for the Southwest producer, and $9,741 for the producer in the West.